Thr Reading Teacher's Book of Lists includes 194 lists that every special education teacher needs to develop individualized programs of instruction. The book includes lists of common sight words, phonically irregular words, phonograms, homophones, prefixes, suffixes, synonyms, antonyms, comprehension skills, critical study skills, content area vocabulary by subject, irregular verb forms, idioms,, work words, application words, graphic organizers, rubrics for writing, computer and internet terms, web sites of special interest to reading teachers, and much, much more. Teaching ideas and activities are included. 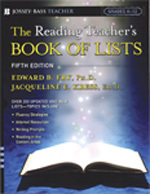 The Reading Teachers Book of Lists is an essential resource for teachers and specialists who work with special needs children.